Gosloving: Ryan talks about The Place Beyond the Pines, his directorial debut and... geese? Ryan talks about The Place Beyond the Pines, his directorial debut and... geese? 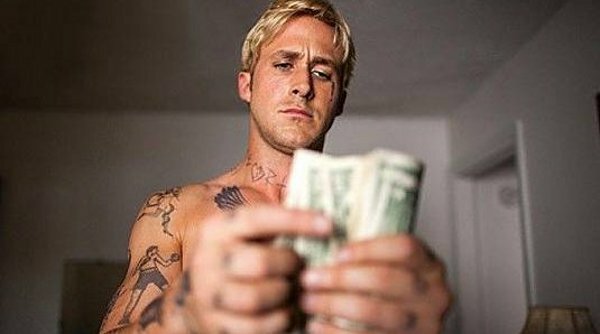 In Derek Cianfrance's The Place Beyond The Pines, Ryan Gosling's carnival stunt cyclist Luke, covered in tattoos up to his throat, bleached blond, with a knife, invites us to follow him. There is Eva Mendes as single mum Romina - does he remember her? Bradley Cooper portrays police officer Avery Cross, a rookie from a wealthy family. Meanwhile, Ben Mendelsohn is a shady mechanic with something less than legal on his mind. Gosling speaks about Mendelsohn's relationship with him and Canada geese, tattoos, How To Catch A Monster and why he felt at home in Schenectady, New York, where the film was shot. Anne-Katrin Titze: Luke has his life written on his body. I was wondering, with clothes, you feel them as an actor - you are changing your clothes, you are changing into another character. Tattoos you don't physically feel, they were obviously painted on you. How did they affect your performance? How did you feel having such a marked body? Ryan Gosling: Ashamed. The plan was, let's create a portrait of Somebody that has lived a lifetime of making bad decisions. So let's put on the most bad tattoos you have ever seen. And when I did the face tattoo, it was just too much, it was overkill. And I went to Derek [Cianfrance] and said I can't do this, I look ridiculous, it will ruin the movie. And he said, "Well, I'm sure that's how people with face tattoos feel." They regret them. I really fought him, and he said, "No, this movie's about consequences and now you have to pay the price." So, I really did feel that overwhelming sense of shame. I didn't want to look at myself in the mirror, I didn't want to be photographed. When I was holding our kid, this kid who played our [Romina and Luke's] son, Tony Pizza, that's his name, I felt so ashamed that this was his father, you know. So, it gave me something that I couldn't have acted. When I was walking into that church and I was looking that way, I felt so embarrassed. AKT: The film draws a line - the patterns on the church windows follow the patterns on your body. They are somehow connected in a very eerie way. RG: Oh, yeah… It's hard to talk about performance without talking about Derek. He never writes these emotional marks into the script. [The crying in the church], that's not scripted. You never come into the scene feeling this pressure that you have to hit this high note. If they happen, they happen naturally. In the case of that [scene], it was early on in the movie and I felt, I got lost in the surface nature of the character and I had overdone it. And I just walked into that church and I felt, like I was saying, that sense of shame, and then that scene happened. The film is filled with breathing and carnival noises, as haunted men cycle through patterns spinning out of control. RG: He is like in the motorcycle version of a boy band in the early Nineties, doing some low-rent carnival circuit. It doesn't get worse than that. He is like a melting pot of every masculine cliche - tattoos, muscles, guns - it's a joke. And then he's presented with this child that he didn't know he had. It's like a mirror is held up to him and he realises that he is not a man at all. That none of those things make you a man. That he's a completely surface person without any depth. There's a tremendous amount of shame. In the same way that he over-romanticises himself and creates his own mythology, he has the same romantic ideas of turning it around and starts robbing banks, which is as unthought out as his face tattoo. The carnival comes to nowhere land Schenectady, New York, once a year and blows the motorcycle stunt driver with the permanent tear into the town where the film was shot. RG: Derek wanted to shoot all the heists in one shot, including the riding in and the escape. The cool stuff was Rick Miller [the stunt double]. You know, when Batman rides a motorcycle, it's Rick Miller. He's the best in the business. He has become a good friend, we had a great time. He was very patient with me. AKT: You have a scene with Ben Mendelsohn in the forest, where you are running after a flock of Canada Geese. It's really funny and at the same time you are preparing for the heist. RG: If we could talk to Ben Mendelsohn right now, he'd be chasing some geese. That's what it's like to hang out with him. I loved [filming there]. I'm from this small town in Canada called Cornwall. It's very similar to Schenectady so I felt very much at home. AKT: You just came across the geese, and said: "Okay, let's chase them?" Derek Cianfrance explored romantic love with Gosling in Blue Valentine (2010) and unearthed his hidden talents through improvisation. RG: I feel very lucky to have met him and to work with him. This movie, I think, is like the directorial equivalent of a bank heist. it just took so much planning to pull it off. What I admire about him so much, is that his filmmaking is, like, invisible, very cinematic, very unselfconscious. He's got guts. The structure of the film took a lot of guts. A lot of people told him not to. He's just the most stubborn person I've ever known. He just will not change it. To me, what's amazing is, it has all the elements of a traditional heist film, crime thriller, family drama. All the different genres, and yet it's kind of deconstructed. Gosling took advice from real-life bank robbers. RG: They said something interesting. In reality, in the bank training, they are told to give the money up. The truth is, all the guns and the yelling and all of that nonsense is not really necessary. AKT: In The Place Beyond the Pines, you are advised that you have to go to the weakest woman teller first. RG: See, I don't think that any of this is necessary. You just go and politely ask for all the money and they have to give it to you. You just have to get away with it. Hitchcock showed us in Psycho, how easy it was, to have audiences jump ship in mid-stream. Anyone who played cops and robbers as a child, knows it too. AKT: Did you connect with Janet Leigh, being killed off half way through the movie? RG: I did. I've never felt more like Janet Leigh in my life. Of course, since I'm talking to a Gosling, I was curious about the cast for his upcoming directorial debut, dark fantasy How To Catch A Monster. RG: You can only be yourself. It sounds cheesy, but when it comes to filmmaking, there's no way to hide. You can tell so much about somebody by the films they make. I like casting people I have worked with before. Christina Hendricks, Eva [Mendes], Saoirse Ronan, Dr Who star Matt Smith, and Mendelsohn. RG: I'm sure they'll follow.